They might be borrowing her band, but they sure can't dampen her soul – because Sharon Jones is strongly back in action, and sounding funkier and more deeply soulful than ever! 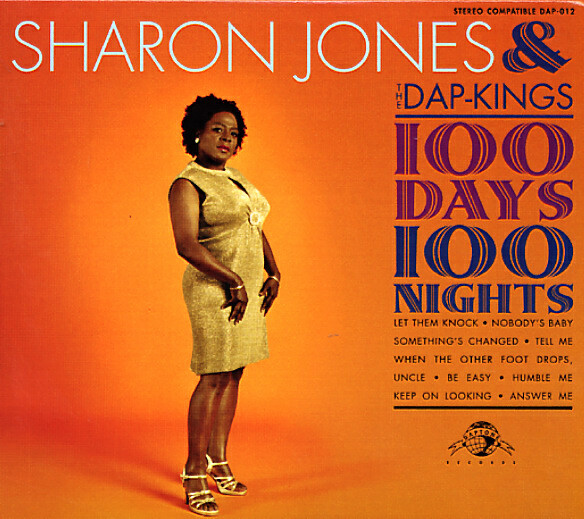 Given that Sharon wasn't singing back in the 60s, it's hard to think we'd be calling her the real deal – but in a world of crossover classic-copping soul singers, or slightly rewarmed older acts, Jones is a true treat through and through – the kind of soul singer whose work still recalls the best era of the funky 45 underground! The mighty Dap-Kings are in full force here – snapping along the groove with a range of classic soul influences – styles borrowed from Memphis, Miami, Muscle Shoals, and more – all sifted down to some of the tightest grooves any singer ever had the chance of working with! The production is amazing – as sharp-edged as the music – and handled by Bosco Mann with a sound that's as faithful to the roots as the cover might imply. Titles include "100 Days 100 Nights", "Tell Me", "Be Easy", "Nobody's Baby", "When The Other Foot Drops Uncle", "Something's Changed", "Keep On Looking", "Answer Me", and "Humble Me". © 1996-2019, Dusty Groove, Inc.